Your skills with positive and negative numbers, order of operations, and the distributive property, unit conversion, along with solving linear equations and linear systems of equations and graphing lines need to be adequate to be successful in this class. 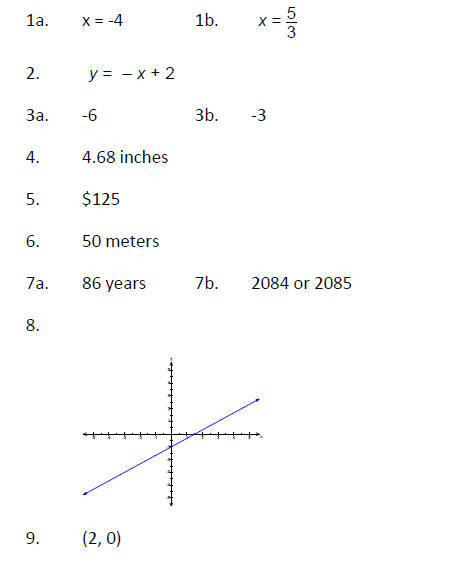 You should be able to do the following problems without a calculator. 2. Solve the equation for y. 4. If 1 centimeter 0.39 inches, convert 12 centimeters to inches. 5. After a 35% price reduction, a DVD player sold for $81.25. What was the price before the reduction? 6. A swimming pool has a width of 25 meters and an area of 1,250 square meters. What is the length of the pool? where E represents life expectance and t represents the number of years after 1950.
a. What is the life expectancy for women in the year 2020? b. In what year does the model predict that women will live to be 100 years old?